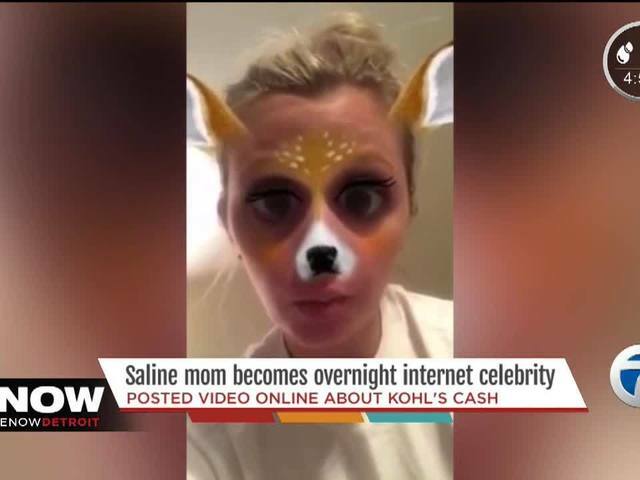 A mom from Saline, Michigan is finding herself in the midst of internet stardom after a video meant to be shared among friends took off, leading to more than 20 million people watching it. “At this point I have hundreds of messages in my inbox on my Facebook page, and thousands of comments of people just reaching out,” said Amanda Bell, the latest viral phenomenon to hit the internet. The video was originally sent to a handful of friends using Snapchat. At their urging she shared it publicly and within 24 hours it had already garnered more than 1 million views. In the days since she posted the video it’s grown so large that Kohl’s, the company she was talking about in the video, responded telling her they have something special in store for her. The video features Bell in a number of voices acting out a scenario where a woman returning an item is distraught over losing her “Kohl’s cash rewards” if she returns her item. Bell was stressing out because she had to pick up her kids from school in less than 15 minutes. While some have called it an internet rant, Bell said it was all in good fun. She said she’s been the other person in the exchange before, in fact, she works retail herself. Like Chewbacca mom before her, she’s quickly gaining notoriety online. There’s no telling whether her fame will continue to build or fizzle. Either way, Bell isn’t taking the moment in the spotlight lightly. Bell, a mother of two children who is going through a divorce, started making videos and posting them to her Facebook page to vent. She said it was a way to cope with the daily stresses of life. When her video went viral she switched them all to public, and now people from across the globe are reaching out after binge-watching her videos. Given that she began posting her own videos while going through stressful times, those interactions mean the world to her, although she admits it’s been hard to keep up with all the posts and personally respond as she originally did. “I mean, like I said in the video, I have to pickup my kids from school!” said Bell laughing. She plans to continue sharing her personal stories, along with her funny videos when they strike her.